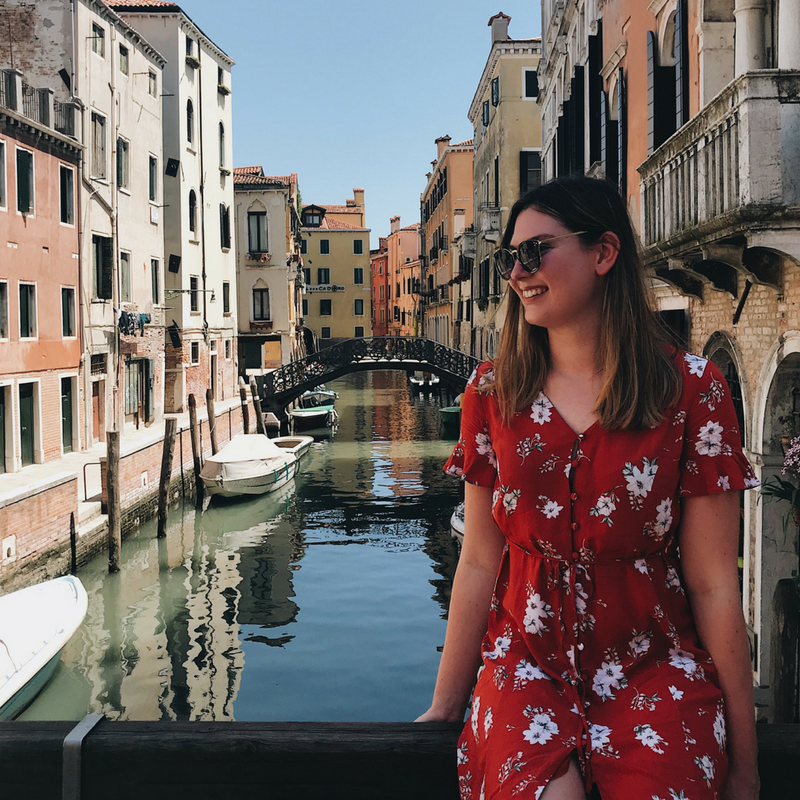 This said when two friends I meet in Bali arrived in the UK, wanting to explore Europe, it seemed silly for me not to join them on a whirlwind two days in Paris. 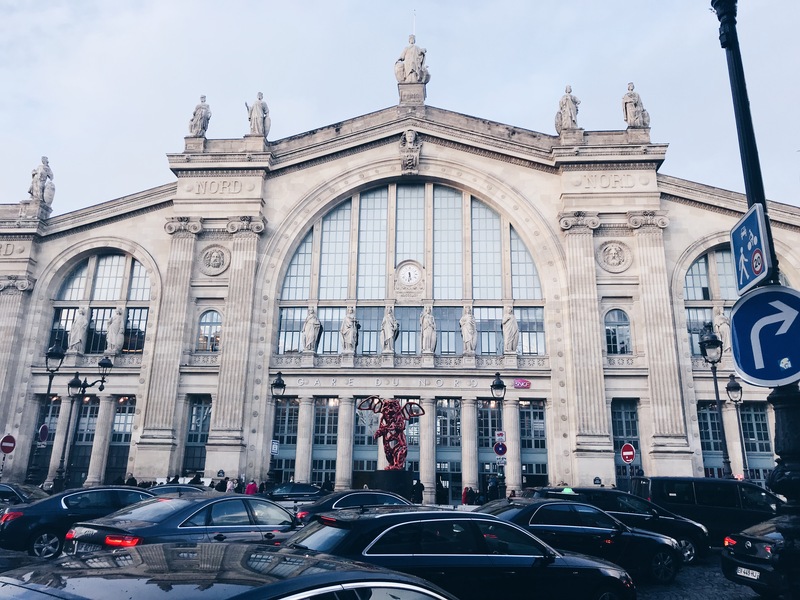 Flights to Paris arrive at Charles de Gaulle Airport which is about a 50-minute train ride from the city centre. However, if you’re travelling from the UK, the Eurostar is a far better option since it stops right in the heart of Paris. Whats more, once you factor in airport security and check-in delays, the Eurostar is also quicker. Tickets start at just £35 each way. However, to get these prices you have to book AT LEAST 120 days in advance. Following this, the closer you get to the departure date, the more expensive tickets get. As usual, I left buying my ticket to the last minute, meaning a return ticket to London cost me about £170 (shout out to my parents for covering the cost as a late birthday present). 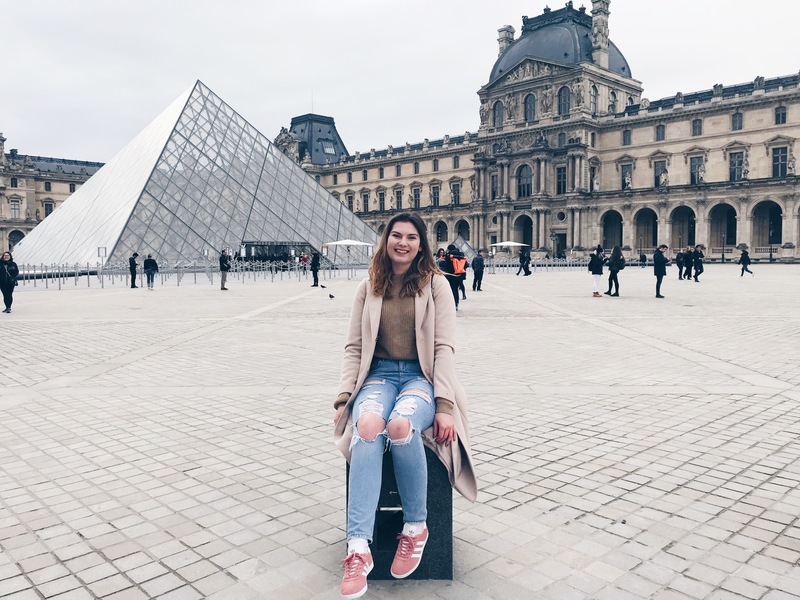 Keen to see as much as Paris as possible, we woke up early on Saturday morning and got the Metro straight from our Air BnB to one of the top attractions in Paris: The Louvre Museum. From here it was easy to access the main entrance to the Louvre (which is actually through its famous pyramid). Visiting in February meant there was no queue for us. However, buying our tickets in advance online still saved time! This is definitely a must if you’re thinking of visiting Paris in peak season, as the line to buy tickets on the day can be at least three hours long!! 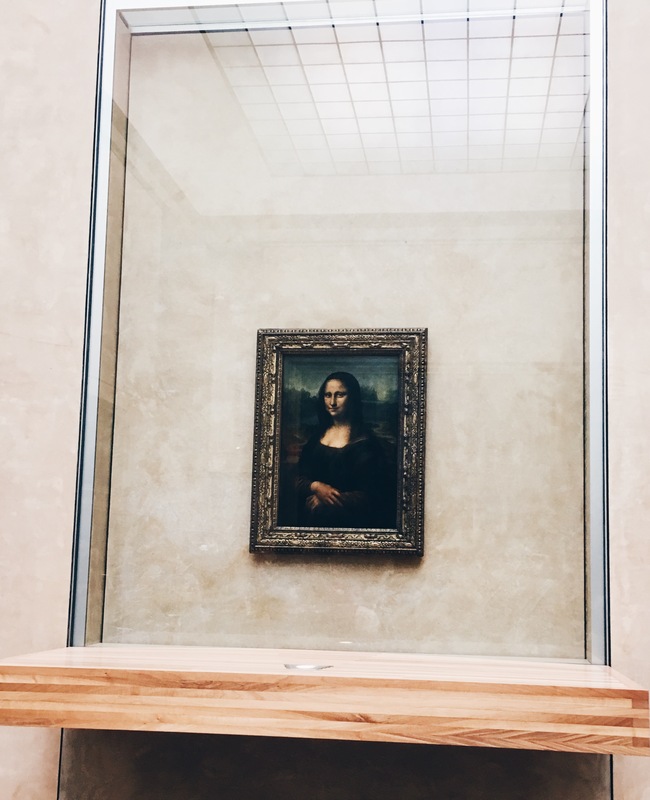 Spending only two days in Paris meant we didn’t have time to allocate a whole day to exploring the Louvre – which is recommended. You’d actually need 100 days to study every exhibit in the museum! In this way, I’d highly recommend having a plan of the things you want to see… of course, the Mona Lisa should be top of that list. After spending a solid 3 hours in the Louvre Museum, it was good to get back into the fresh Parisian air. Next, we opted to walk through the ‘Jardin Des Tuileries’, a fabulous public garden which links the Louvre and the Place De La Concorde (our next Paris attraction). Although admittedly a little bleak in winter, the park/garden would be a beautiful spot in summer! Walking along I couldn’t help but picture myself returning in warmer weather to relax on one of the garden’s deck-chairs. Our walk through the Jardin Des Tuileries brought us to the ‘Luxor Obelisk’, a 22.5-meter high Egyptian obelisk, originally from the Luxor temple in Egypt (hence the name). The Luxor Obelisk was gifted to the French in 1833 and has stood in the centre of the Place De La Concorde ever since. Nowadays it looks a little out of place in the middle of one of the busiest traffic circles in the world! But, as with any Egyptian artefact, it was truly fascinating to look at. When in Paris there’s nothing better to have for ‘lunch’ than the ‘best maccaron’s in the world’. 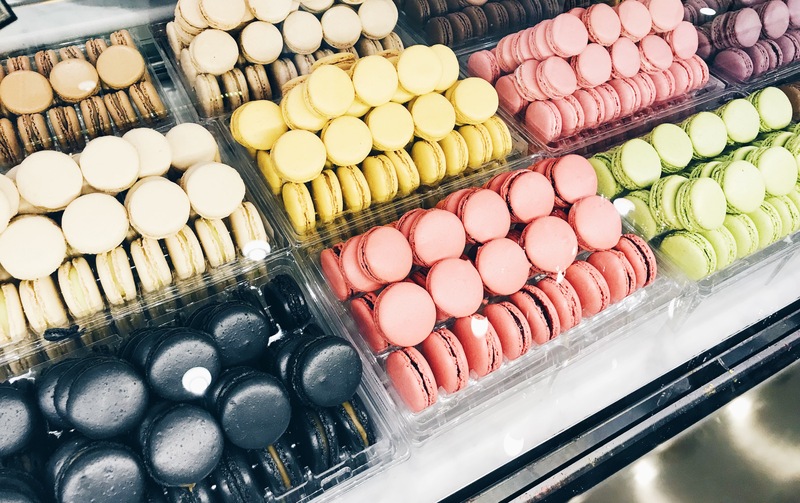 Thus, the next stop on our two days in Paris itinerary was the Ladurée Maccaron shop, which is located on the Rue Royale, a side street off the Place De Las Concorde. After filling up on Maccaaron’s we were ready to partake in one of the top things to do in Paris: shop! Av. Des Champs-Élysées is often described as the ‘worlds most beautiful avenue’. It stretches from the Place De Las Concorde to the Arc De Triomphe. Its symmetrical landscaping and sheer scale perfectly sums up the Parisian ‘vibe’. More than this though, the Avenue is lined with luxury stores such as Louis Vuitton, Gucci and Mont-Blanc. 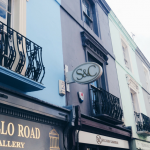 Although these are great for window shopping there’s also plenty of stores for the average earner… Including a Sephora (which London is in desperate need of). Anyway, I digress, our main reason for walking down the Av. des Champs-Élysées, was to reach the famous Arc De Triomphe. I have to admit that it was slightly further away than I had anticipated, it almost felt like the Arc was a mirage that got further away the closer we got!! However, when we finally reached the Arc it was more than worth the walk. For me, it’s simply not done justice in photos. I’d love to have taken in the views from the top of the Arc De Triomphe. However. we didn’t book tickets in advance and waiting in the queue would have wasted the rest of our day. Rather than wait in the queue to buy ticket’s for the Arc De Triomphe, we made an executive decision to instead take an uber to probably the most beautiful area of Paris: Montmartre. This is an area you really don’t want to miss when travelling to Paris! Picture, quiet stairways, narrow alleys and ivy-clad houses. 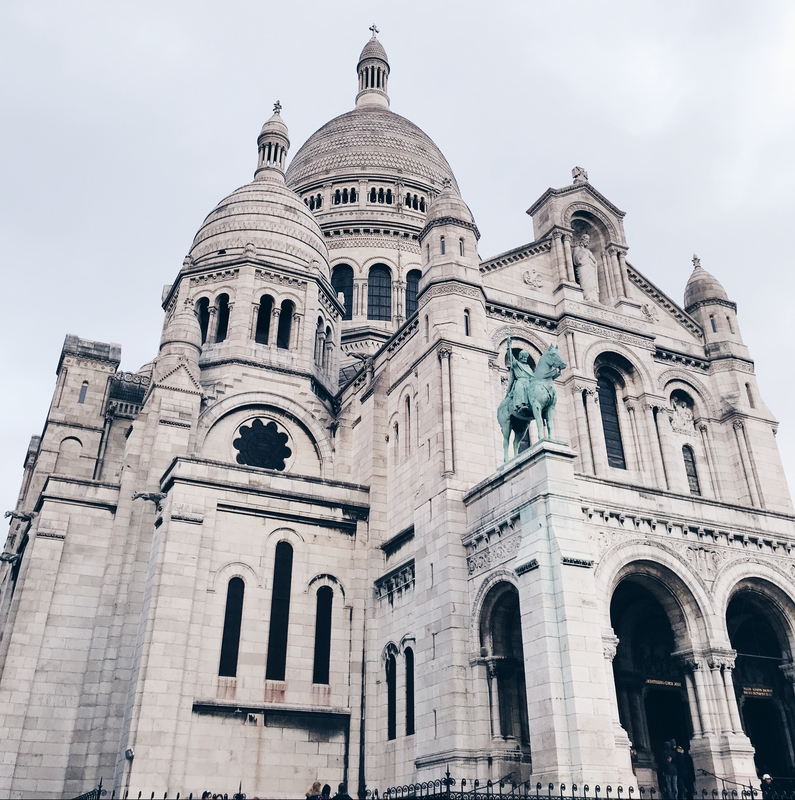 Other than the beautiful streets, Montmartre is home to the Sacré-Cœur church which, is without a doubt, one of the best attractions in Paris. The architecture of this ‘basilica’ is like nothing I’ve seen in Europe before. It resembles the Taj Mahal more than any Christian church. The stairs leading up the Sacré-Cœur were packed when we arrived in the late evening. We quickly found out that this was for a very good reason. The church’s location on top of a 133m high hill provides the perfect outlook over Paris, which is even more breath-taking come sunset. 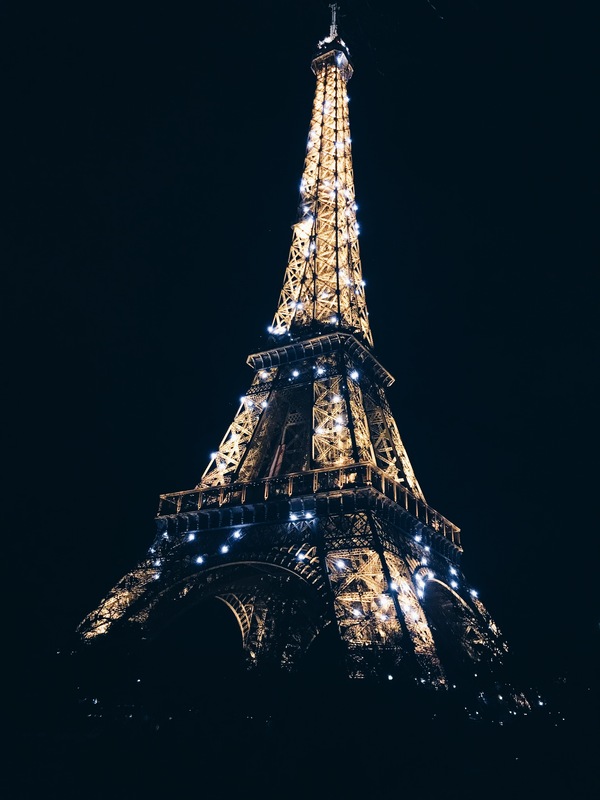 Although part of me never wanted to leave Montmartre, a ‘two days in Paris itinerary’ is simply not complete without a visit to the Eiffel tower at night. The best place to view the tower (day or night) is from the ‘Champ de Mars’ lawns. We sat on our coats here to watch the towers light display which occurs every hour, on the hour for five minutes. A man even came over to sell us beer and champagne! Although this type of thing normally annoys me, on this occasion, a drink was the perfect way to end the day! The second of our two days in Paris was more relaxed. After squeezing so much into our first day, we were ready for a more relaxed pace! In this way, we planned to start the day with a leisurely brunch at the Australian ran ‘LouLou friendly diner’. Amazing reviews online inspired us to take the metro to the other side of the city. Sadly, we made the rookie error of not checking the opening times, meaning it was closed on our arrival. It turns out that its quite common in Paris (especially in the ‘off’ season) for restaurants/cafes to close on a Sunday, so make sure you don’t make the same mistake as us! 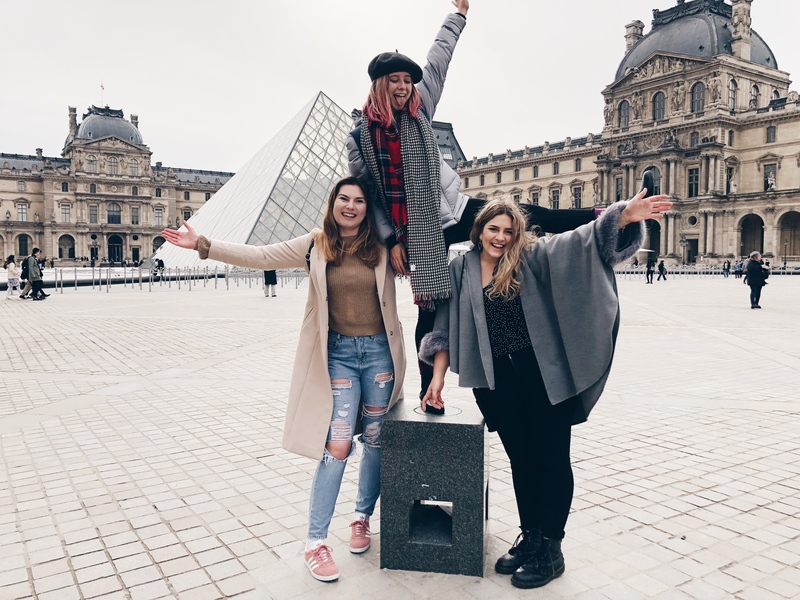 Luckily, our spirits weren’t dampened by our failed brunch because our second day in Paris centred around the cities most famous landmark – the Eiffel Tower! Tickets to the top floor are as cheap as €6.30 for students (€25 for adults) on the towers official website! But, as usual, I left buying tickets too late (I really should learn) meaning these were all sold out. Instead, I bought tickets through getyourguide.com for around £50. Although a lot more expensive, this actually turned out to be a great option as our guide was super lovely and gave us some really fun facts about the Eiffel Tower. Sadly the weather was not great for our visit but the experience was still amazing! Something I’d definitely recommend is stopping for lunch at the Effiel Towers 58 Restaurant. Here fine dining meets fantastic views as the restaurant is based on the first floor of the tower. Despite its prime location, the lunch menu is relatively affordable: two courses for €18 or three for €24. Granted the portion sizes are a little small, but considering you’re eating ON the Eiffel tower I’d say its pretty good value for money. 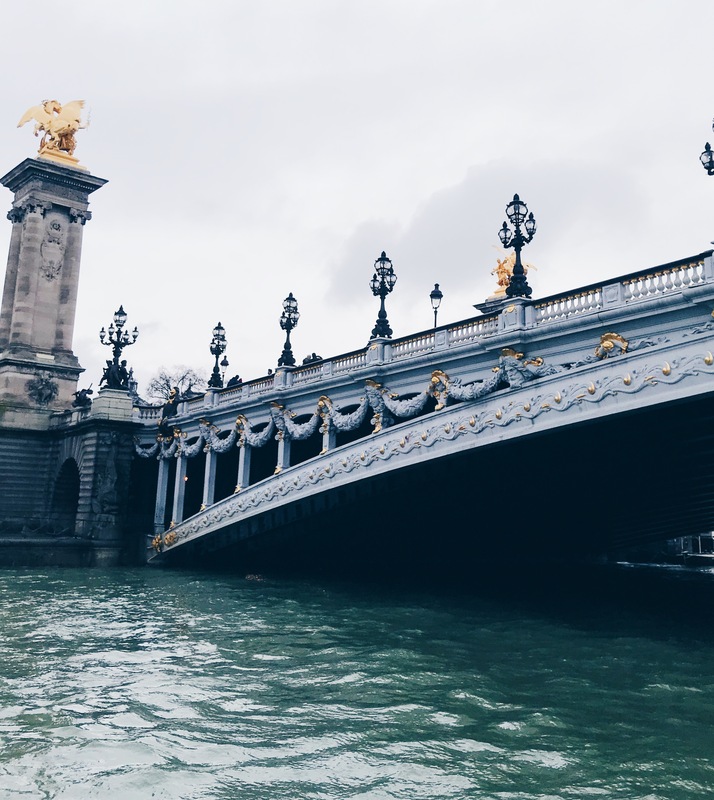 Some people say that a river cruise is one of the best ways to see Paris. Seeing as a cruise was included with our Eiffel Tower tickets, we decided to end our time in Paris by cruising down the Seine. Sadly, apart from getting a glimpse of the Pont Alexandre III bridge, the cruise didn’t take us to any new attractions in Paris, it simply went to the Louvre and then turned around. 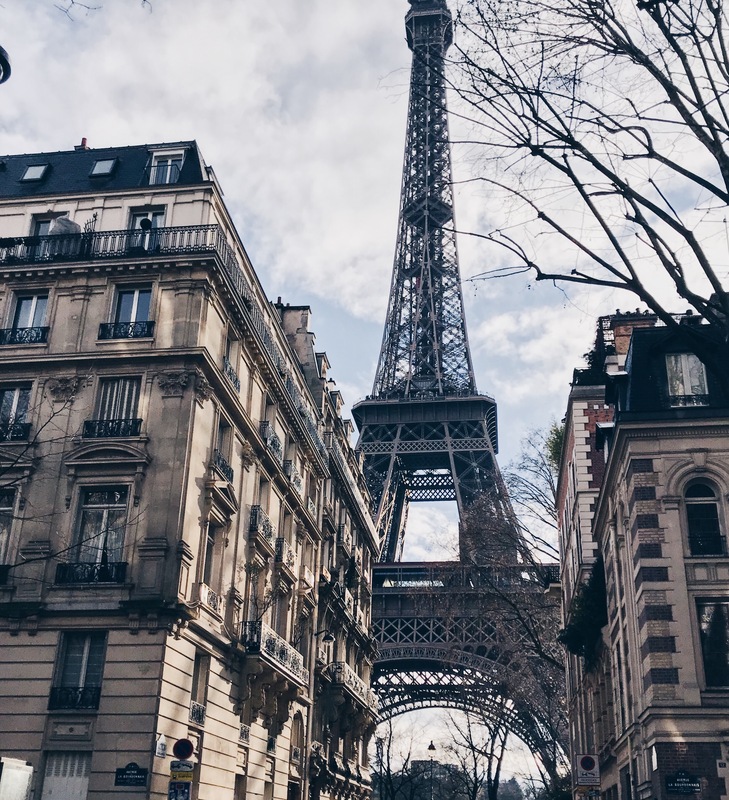 I suppose for a free-add on it was a good way to get another perspective of the city, but honestly, it was one thing on our ‘two days in Paris itinerary’ that I would have been happy to miss. 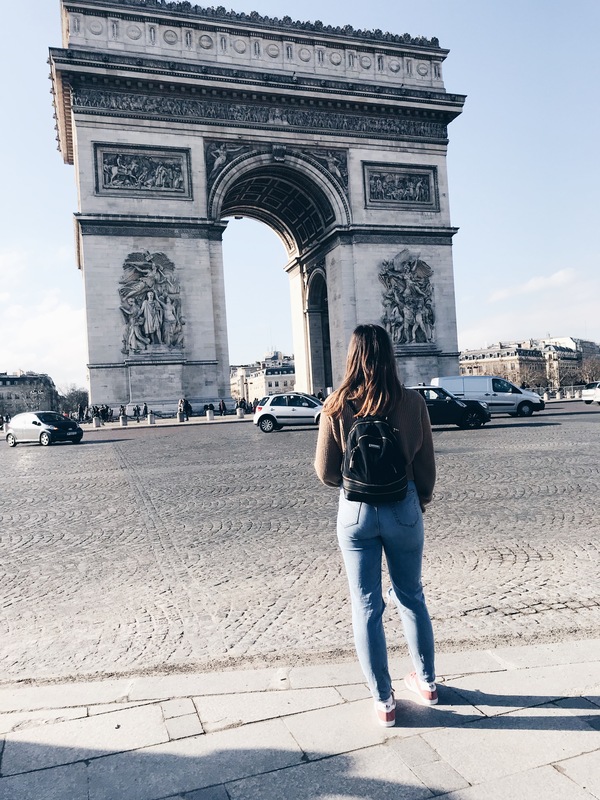 Following my two days in Paris, I truly fell in love with the city! To be captured by its charm I think you simply have to travel to Paris without unmeetable expectations, keep an open mind and I’m sure you’ll be as captivated as I now am! Wow! Thank you for sharing so many beautiful photos! I haven’t been to Paris since I was like 10 or 11 years old. Definitely want to go back again. Thanks for the guide! The Eiffel Tower just looks spectacular at night and I really like the sound of the evening river cruise – great suggestion! This reminds me of my visit to Paris. We only had three days there, but were determined to see and do as much as we could. We had early mornings, late nights, and LOTS of walking, but we got to see all of the highlights. It totally can be done if you’re short on time! Soooo much walking haha, I think we did about 15miles over the two days! What a funfilled trip. Your pictures are so beautiful. Makes Paris look very dreamy and romantic. We only went in to have a sneaky wine thinking the same price wise! But once we discovered how reasonably priced the food was we couldn’t resist. (Although I do think it gets expensive/fancier in the evenings). Wow! You all packed a lot of stuff into 2 days. It looks like you had an incredible trip. Paris is such a great city with so much charm. I feel like everyone should visit it at least once in their life. Aw I love Paris! It’s a magical city and I love returning every time I go! I have to agree- these are the must sees when you’re only there for two days! I’ll definitely be returning so its good to hear that it’s just as magical on second/third visits! We spent a couple of hours in the Louvre as well and definitely agree that you should buy your tickets ahead of time. It saved us so much time especially since we went in July! We loved the Maccarons at Lauduree! You absolutely have to see the Eiffel Tower at night. Isn’t it beautiful. We didn’t make it to Monte Marte but it looks incredible and very different from the hustle and bustle of busy Paris. Great list of Parisian highlights! I definitely had to chuckle when you mentioned Ladurree – definitely, a must have in Paris! I feel like Paris is one of those cities you can never really see enough of. This is definitely a good way to see the brief experience while there for only a couple days! I dunno… I stopped by Paris on the way back from England a long while back. My dad and I did the sights and wandered around. 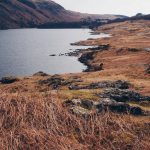 It felt just ok – we were glad to have gone, but it didn’t arrest me the way Rome did. I know someone who would stare daggers at me for saying that though! That’s totally understandable! I’ve heard a lot of people say the same thing, and I feel the same way about some cities that others adore! So sometimes it just comes down to your own experience! Paris is never ‘meh’ hahaha. But as I was reading through your post, I think you discovered that for yourself. For me is number one on my list. Been there 3 times, and I still haven’t managed to see it to the fullest. There is always something to discover. And that’s what I love about it. Your guide is close to what I did the first time I went to Paris. Except the macaroons and eating in the tour (see always something new to do). I totally agree with Louvre. Even if you have no inclination to art or you are completely parallel with it, you will still be fascinated by it. As for Monalisa.. I don’t know about you, but for me it was a shock on how small it is! Yeah I LOVED PARIS! but I’ve heard of others who don’t so was a little unsure before visiting…. I can’t wait to return and see what else there is too do! But yes the Monalisa was sooo small and it was super crowded! Loved your post. Like you, I was invited to Paris, (kinda didn’t want to go! )& had no expectations. And like you, I fell in love with the city. We did pretty much the same things you & your friends did. It was great reliving my trip through Paris by reading your post! And I’m glad reading your article. But want to remark on some general things, The website style is great, the articles are excellent. Good job.